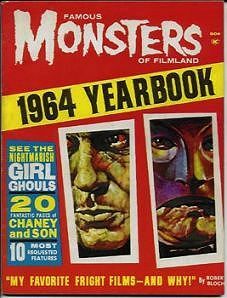 Second Famous Monsters Yearbook from 1964 in beautiful condition. This mag came out during the height of the monster craze. Check out the great ads in the back for all of the classic monster stuff for sale. Website design and hosting by Sohodojo Business Services. Item 162 of 466 items displayed in viewer. 0 items in cart.